Our goal in this step-by-step instructable is to build a device you can clip to your belt and wear throughout the day. 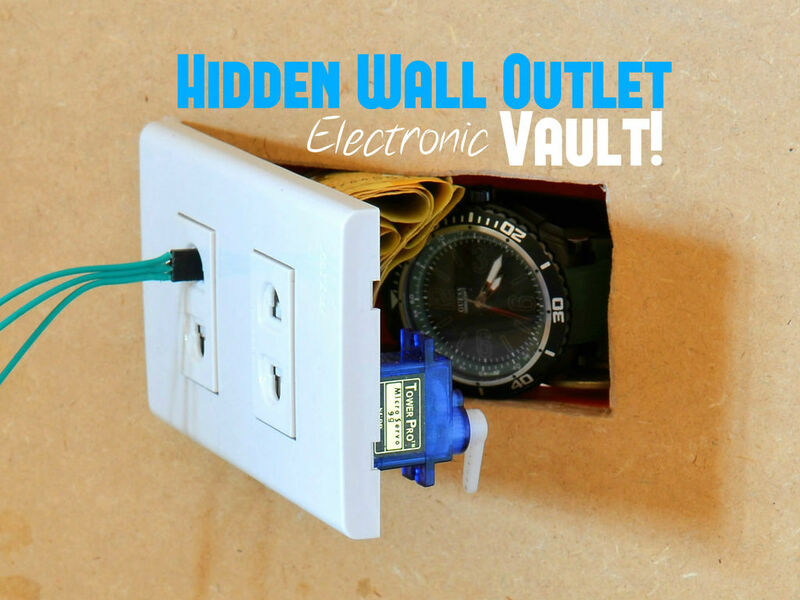 This device will log data that, when downloaded to a back-end server system, will provide a report showing the location history of your day along with the breakdown of how much time you spent indoors and outdoors. The accelerometer constantly looks to see if the user is in motion. 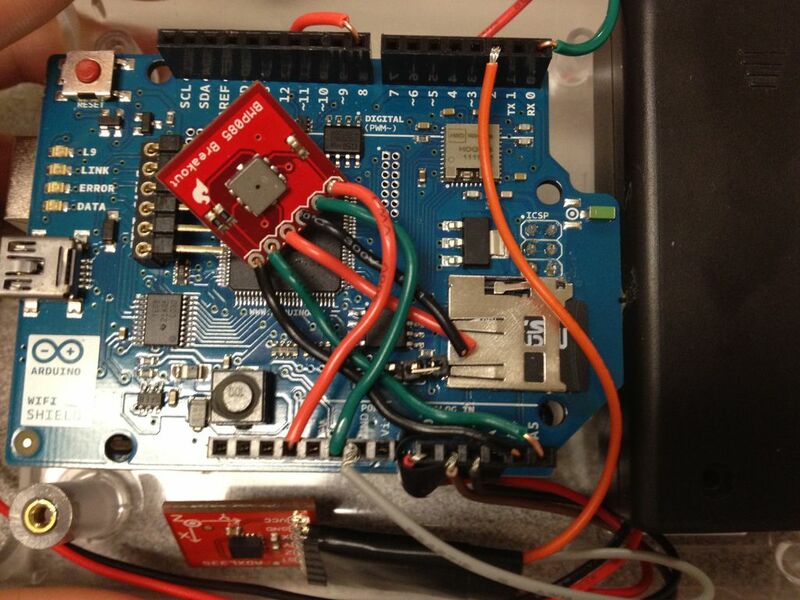 While the user is at rest, the unit takes a GPS and temperature reading every 15 minutes. When motion is detected the GPS unit is turned on. After 2-minutes passes the GPS unit and thermometer again take samples. If motion was detected during that two minute period the 2-minute wait and sample period repeats until the user is at rest again. This is done in order to conserve energy. All the GPS and temperature data is stored on the SD card. Upon pushing the button on the front of the unit, all data is off-loaded (requires a USB connection to a laptop) and sent to a back end server system for analysis. The backend algorithm (coded in Java) extracts the useful features from the data (such as GPS error, # satellites and temperature) to build a decision tree that classifies the location as indoor or outdoor. The algorithm also utilizes the assistance of online public weather API’s as well a GIS web service which tells if lat/long points are within a building or not, to produce a report for the user. The report shows the amount of time (discrete periods of the day) ,and location history along with whether the user was inside or outside. We will use the following shell from Adafruit to encase the project http://www.adafruit.com/products/337 This shell can be used for many other projects and is designed to hold an Arduino and an Ethernet shield within the case. The WiFi shield must be a touch wider than the Ethernet shield as the shell barely screws together tight when you put it together with both devices in there. Once you place wiring into the female pins there is a small amount of pressure being applied to the Arduino itself, but I do not think this pressure will cause any damage to the shell or the Arduino. The shell has a nice few screw hole designed to hold the Arduino. We’ll screw the Uno itself to the shell using the enclosed screws and move on…. Failing to recognize these pin-outs will cause either the shield or your external peripheral to stop working. We’ll simply slip the shield onto the Uno and slip the SD micro card into the shield itself and continue…. I chose to solder wire to the pin-outs, as shown, to allow more flexibility in the placement of the device. Leads would add to the inflexible size of the device as wires allow me to bend them as needed all the way down to the breakout board. We will explore wiring later in the project, for now we simply just solder the 6 – 3″ wires to the breakout board and trim them later as needed. The GPS will sit on the side of the case along with the wiring for the button and the LED. The unit itself is also quite size-able so I will simply solder wires directly to the GPS unit. This will allow me to place the unit where I see fit and not have the additional constraints that leads might provide. Orange – 3.3V (the GPS can handle 5V as well if needed). We chose digital 8 to power the device as it gives us the ability to switch the unit on and off as it draws quite a bit of power. We will use the accelerometer to dictate when we need to gather a GPS signal. Thus simple ‘digitalWrite(8, HIGH)’ and ‘digitalWrite(8, LOW)’ commands will allow us to easily switch on and off the unit. We tape the back of the GPS unit to prevent shorting from taking place in the event a bare wire makes contact with the Unit. This also protects the back of the unit as it will later be packed tight into the shell. I chose to solder 90-degree leads to the accelerometer instead of directly soldering wires to the device. 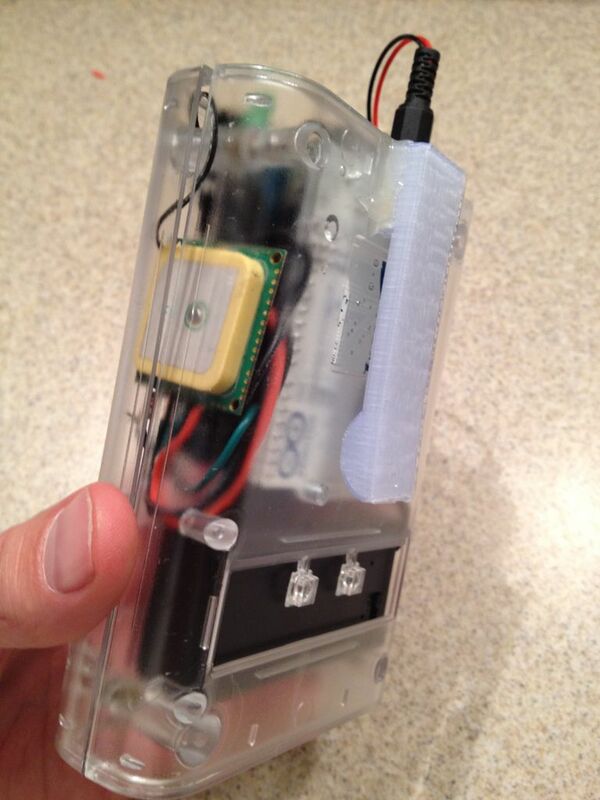 The layout within the case will be such that the accelerometer will have more free space around it. Leads also allow for easy integration with a breadboard if I decide to use the accelerometer in a future project. Thus I will essentially have a plug-and-play accelerometer with the help of a few wire with female connectors on one end. Now that the accelerometer is plug-and-play ready we will prepare the wiring to allow such a connection. We will use pre-terminated wires that have female connections on one end and male leads on the other end. The male ends tend to break if bent too much so I’ll cut off the male ends and strip the wires, leaving about 2″ of free wire on each. We’ll trim each as needed later as we connect to the Uno. On the female side, I’ll wrap every other end in electrical tape to eliminate any shorts that may occur if the touch one another as I connect them to the leads. We then plug each end into the leads of the accelerometer in an alternating pattern as show in the picture. We’ll conclude the connection by wrapping the connections in electrical tape. We will actually start connecting devices at this point. As noted earlier, the green wire (from RX pin connection on GPS unit) will go to the TX pin (digital 0) on the Uno. The power cable will go to Digital 8. The ground will stay out for now. We’ll later attach the ground lines from other peripherals to this wire as many things need to share a common ground. One thing to note about the GPS unit with this connection: The RX/TX connection pins replaces the serial communication of the USB serial cable once this unit is powered up and running. Thus, if the GPS unit were cabled up to the 3.3V or 5V connection vs. the digital pin you would not be able to upload code to the Uno as the GPS unit would be using the Serial. One should use a similar wiring approach when testing the GPS unit to allow for code uploading. Otherwise you will need to disconnect either the power or serial wire each time you need to upload code.